Please join us for this talk with Prof. Will Smiley, who will discuss his new book, in which he charts the changing law and practice of captivity and slavery in the Ottoman Empire and Middle East, at the intersection of Islamic and international law. The Ottoman-Russian wars of the 18th century reshaped the map of Eurasia and the Middle East, but they also birthed a novel concept—the prisoner of war. For centuries, hundreds of thousands of captives, civilians, and soldiers alike, crossed the legal and social boundaries of these empires, destined for either ransom or enslavement. But in the 18th century, the Ottoman state and its Russian rival, through conflict and diplomacy, worked out a new system of regional international law. Ransom was abolished; soldiers became prisoners of war; and some slaves gained new paths to release, while others were left entirely unprotected. These rules delineated sovereignty, redefined individuals’ relationships to states, and prioritized political identity over economic value. In the process, the Ottomans marked out a parallel, non-Western path toward elements of modern international law. Yet this was not a story of European imposition or imitation—the Ottomans acted for their own reasons, maintaining their commitment to Islamic law. For a time even European empires played by these rules, until they were subsumed into the codified global law of war in the late nineteenth century. 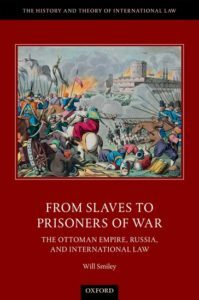 This book offers new perspectives on the histories of the Ottoman and Russian Empires, of slavery, and of international law. Will Smiley is a historian of the Middle East and of international and Islamic law, with a particular interest in the Ottoman Empire. He is Assistant Professor of History and Humanities at Reed College in Portland, Oregon. He received his PhD from the University of Cambridge and his JD from Yale Law School, and previously held fellowships in Near Eastern Studies at Princeton University, and in Legal History at New York University. Prof. Yanni Kotsonis is founding director of the Jordan Center for the Advanced Study of Russia at New York University (NYU) and associate professor of history and Russian and Slavic studies. Dr. Karin Loevy is the manager of the JSD Program at NYU School of Law. Her new book project, Visions of Territory: Negotiating the Future of the Middle East (1915-1923) is a history of international law in the pre-mandate Middle East. This event is co-sponsored by the IILJ, the Hagop Kevorkian Center for Near Eastern Studies, and the Jordan Center for the Advanced Study of Russia. It will take place at the Richard Ettinghausen Library, 255 Sullivan St (at Washington Square South).